You know how salads in restaurants tend to have eight things in them, at least? Or else, it’s not really a salad, it seems. One of those ingredients is usually cheese; another is usually nuts (and it’s usually crusted with something sweet). There’s often meat, grilled and served hot in contrast with the cool greens. It gets more complicated, too. Dried or fresh fruit, oily crusts of bread or croutons, dressings that are an army of ingredients in themselves, and so many types of mixed lettuces when you couldn’t identify one by name. All told, they can be a mouthful to say, and many more gaping ones to eat. Major league salads like these are often taken as a complete meal — they’re a smorgasbord of everything you need in dinner. Nothing against them, and of eating fresh, but what of the simpler times, when just a couple of well-paired components might suffice? Now that sounds refreshing to me. 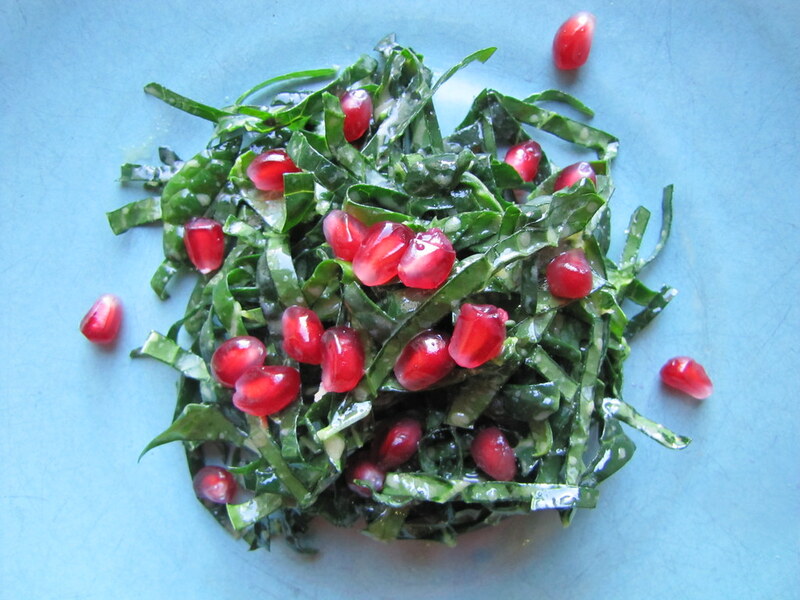 So what happens when you have leafy Tuscan kale, fresh and finely shredded, and a juicy pomegranate sans peel? You’re two-thirds of the way to an uncommonly satisfying salad. Some olive oil, vinegar, honey and a dab of mustard, and a one-two-three dressing for them is done. 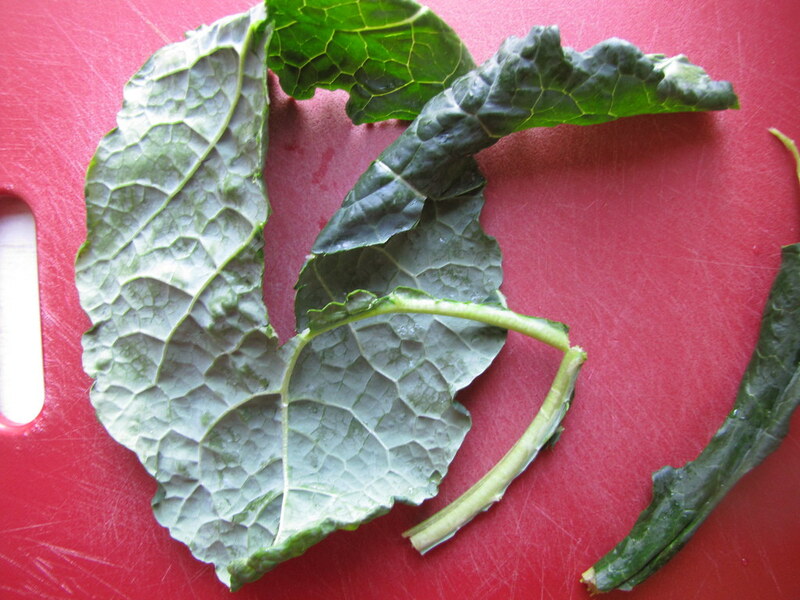 Running my fingers across the leaves of the Tuscan kale I’d found at the market I knew that I didn’t want to cook it anymore. This variety has broad, billowy leaves that more resemble chard than the common kale. It doesn’t have much crinkling around the edges, and the stems are a cinch to remove. I’d gotten a bunch from D&J Organics (the farm stand at Union Square with all the pickled veggies and spiced tofus out to sample), but they’re grown at many other local farms, even in this dead-cold time of year. Roasted, braised or quickly sauteed, they’re a great side for any entree; but fresh, you can really taste their grassy greenness and they’re even more potent with vitamins. 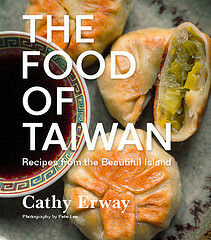 I was also inspired to serve them fresh by Stacey Murphy, of BK Farmyards. When she came on Let’s Eat In last week with Liza de Guia, she spoke of making a pesto with fresh, pulverized kale instead of herbs. I’ll have to try that still, but in the meantime, I rolled up a few leaves and chopped them into stringlike chiffonades for this salad. I also mentioned a story in the Times called the 11 Best Things You Aren’t Eating, when we were talking about rutabaga. Turns out rutabaga was not on that list, I was mistaken, but pomegranate juice was, and it was true that I wasn’t eating (or drinking) it. Pomegranates are not local, and once broken open, they kind of look like they came from another planet. But as the story said, they’re full of antioxidants, and may lower blood pressure. If the juice seems too pricey to splurge on, one pomegranate will probably give you a cupful, and you can use the seeds in more ways than just popping them in your mouth. Try them on cereal, ice cream or salads. They make a bit of a mess when you peel the pith and skin away, as the ruby red nuggets tend to burst now and then and squirt all over the counter (I was peeling one in front of the computer and was amazed to find red droplets on the screen). But they’re so pretty and tasty you’ll want to forgive them instantly. How this recipe post became so unwieldy and convoluted for such an uncomplicated dish, I’m not sure. But I’ll leave the recipe to speak for the rest of the preparation, and keep in mind that some things, like salads, are best kept short and sweet. 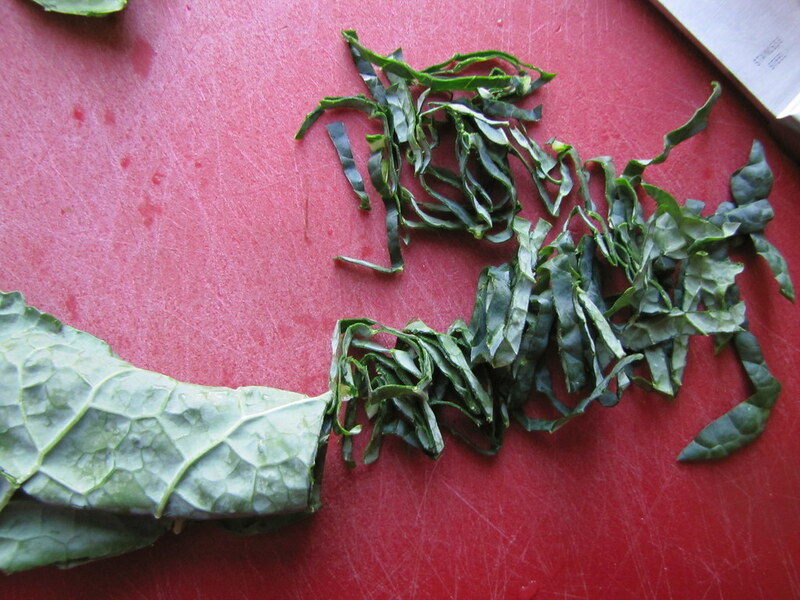 Remove as much of the stems from the kale leaves as desired. Roll them up lengthwise, and cut into thin, 1/8-inch strips. 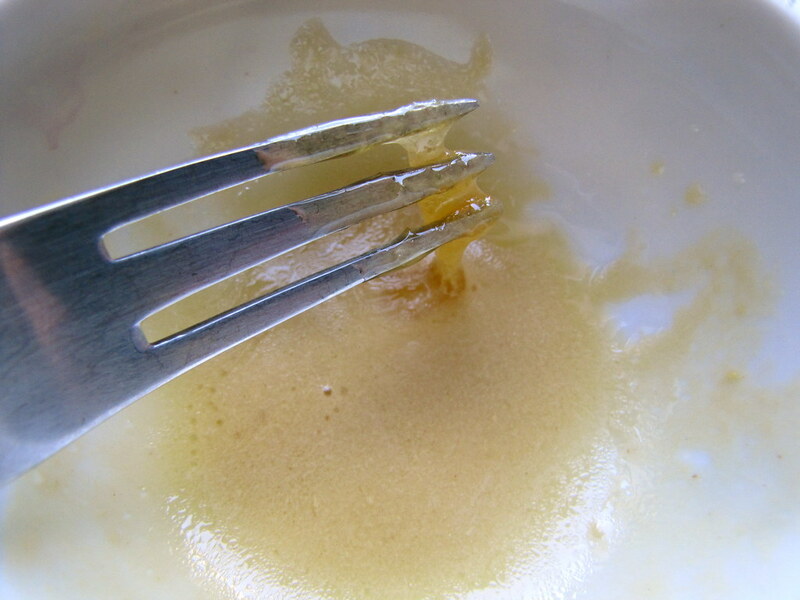 In a small bowl, combine the honey, mustard and vinegar. Drizzle in the olive oil while stirring rapidly to emulsify. 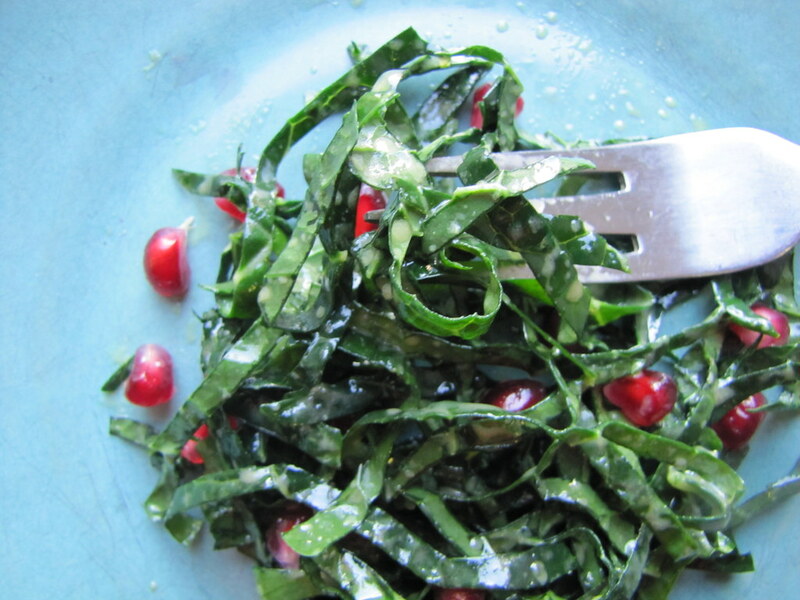 Toss with the kale, and top with the pomegranate seeds. Two brownie points: This one is teetering toward one brownie point, but given the generous amount of dressing I gave my batch, I think I’ll save the golden score for another time. As mentioned, pomegranates have you covered on antioxidants, and they’re pretty low in calories for being so sweet. 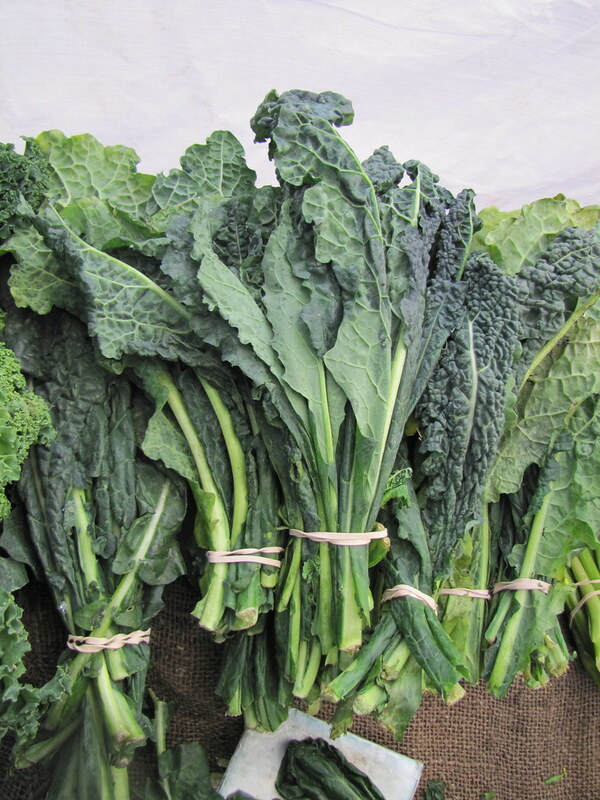 If you aren’t eating kale, it’s one of the best foods for you, too, and any kind. It’s dense with Vitamins K, C and A, and it’s got iron, fiber, calcium, B-vitamins, protein, and gosh, I’m not sure what it doesn’t have anymore. This dish is a really good way to keep winter colds away. Five maple leaves: It’s mostly kale, from D&J Organic Farm in Suffolk County, so it’s pesticide-free and less-traveled. The pomegranate was grown in Mexico, according to its sticker, as it’s a tropical fruit. Honey was the only local part of the dressing’s ingredients, I’m afraid, though there are some great mustards being made around Brooklyn nowadays, like McClure’s. Looks very tasty! 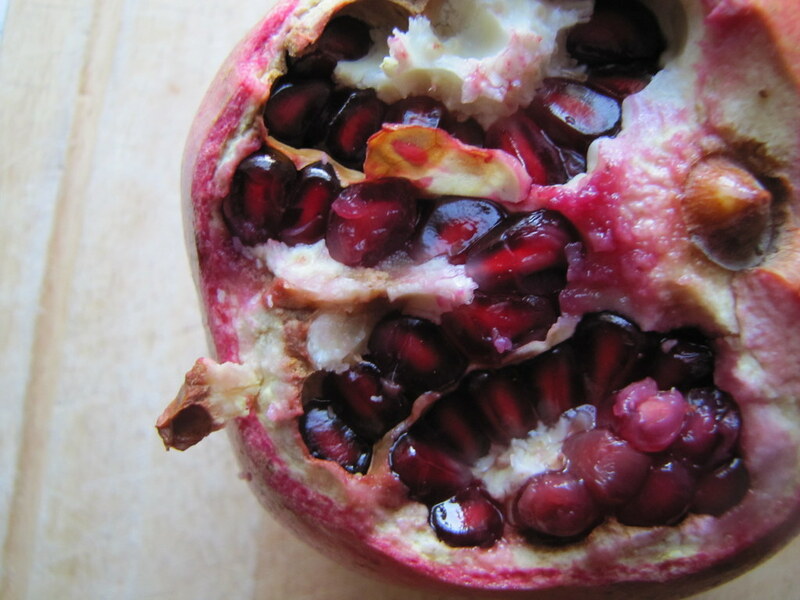 Here’s a trick for seeding the pomegranates–cut into quarters and submerge in a bowl of water. Separate the seeds from the pith underwater, and there will be no splatter. The pith floats to the top of the bowl and can easily be skimmed off. Drain the seeds and you’re done! I cut my pomegranates in half, hold over a bowl, and smack like crazy with a wooden paddle (spatula?). Most of the seeds drop out whole and what’s left usually falls out when you break it open more. And I’m totally with you on “less is more” when it comes to a refreshing salad. This looks simple, beautiful, and delicious. Hi Cathy! I learned a clever trick for seeding pomegranates at a cooking class–if you peel them under water in a bowl, first of all they won’t squirt everywhere, but also the white pith floats to the top and the seeds sink to the bottom. It is great! I love fresh pomegranate seeds and they look divine in that salad! Perhaps some crisp rose would be a good wine pairing, although kale may be tricky to pair with wine. Trader Joe’s by Union Square tends to carry pomegranate seeds – already seeded. A little more expensive than your cost here, but saves the work & mess of the seeding. But buy them close to when you’ll use them – they start to get a little musty after about 3 days, and then moldy. I use them on top of banana & greek yogurt for breakfast. Looks like a delicious recipe. I make Kale salad and it is surprisingly sweet and tender. To seed a pomegranate, slice the stem end off about 1/2″ down into the fruit body. You will now see the sections exposed, separated by pith. Slice down thru the pith to release each section, like you would to cut an orange into sections. The seeds release quite easily this way..read this at my local grocer after years of messy other methods!! Perfect work you’ve got finished, this site is de facto great with wonderful info. Time is God’s strategy for keeping anything from going on at the same time.